Nfotec Digital Engineering Pvt Ltd is a leading provider of engineering services solutions catering to multiple verticals and cross-section of functionalities. The company has a full spectrum of services catering to all the engineering needs during product development, from basic Computer Aided Designs (CAD) to high-end Computational Fluid Dynamics (CFD), Fluid–Structure interaction (FSI) and Finite Element Analysis (FEA), EM analysis, EMI EMC prediction, and System level EM certification services. 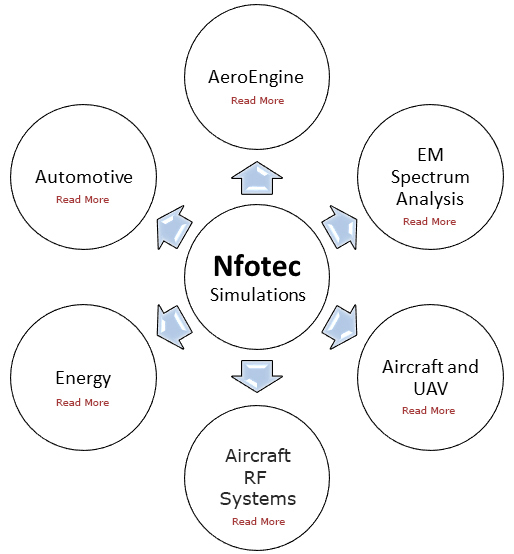 NFOTEC has range of experience in engineering services for the aerospace, defense, Turbomachinery, multi-physics, energy & automotive segment has helped clients immensely in implementing innovation and improving performance. Our Engineering services range over from design, analysis, life prediction, Test Data Analysis to Validation. We also enjoy the status of having some of the industry leaders as our clients. We provide solutions to clients on some of the most leading platforms or software of their choice and our team is able to provide engineering services on the basis of onsite/offsite. We provide world class CAE products in the areas of Computational fluid Dynamics, Finite Element Analysis, Fluid Structure interaction, Flight Dynamics & Controls Simulation and optimization.